The rules of the game tell us a brief history of this battle; June 6th, 1944. It was felt by the Allies that the position the Germans held on top of the cliffs at Pointe-Du-Hoc was too strong. They had guns with them that could, from the top of the 100 foot cliff, accurately hit anything attempting to land on the beach. The Second Rangers (an American unit formed specifically for this mission), under the command of Colonel James E. Rudder were assigned to stop them. After a difficult landing, under heavy fire from the Germans they managed to reach the top of cliffs. Here they found that the guns had been withdrawn from their stations several days beforehand and only dummies left in their casements. One Ranger patrol went south searching for the missing guns. Two concentrations of Germans had remained; one in the south-west antiaircraft bunker, the other in the observation bunker. Despite repeated attacks these resisted and were the most dangerous of the German forces in the area. The single Ranger unit finally found the guns sitting quietly, unguarded, in an apple orchard inland. They placed incendiary devices inside them and completed their mission. Landing on the beach puts you at a fairly strong disadvantage to the Axis player; you’re in the sea, which gives you movement restrictions, and retreat penalties, but you get six command cards and you move first, so it’s not all bad. You have to factor in that you cannot scale the cliffs in one move, the special rules for this scenario state that you must use two moves, to scale a cliff from the beach side. 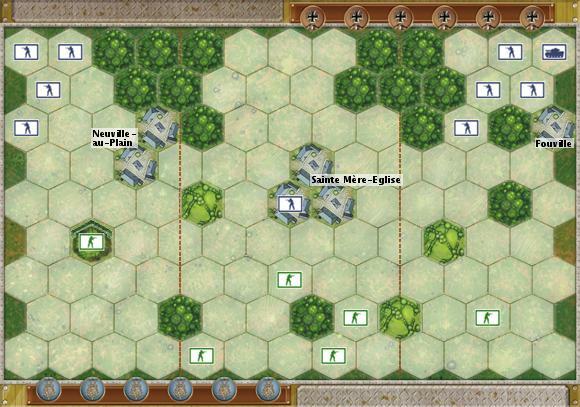 However, your units are Rangers, so they can all move two hexes and still battle, which is a big advantage, and makes life much harder for the Germans. The victory condition is four medals; we found that the most promising way to achieve this was to storm straight up the middle and try and take out the units in the sandbags, plus the left-hand one in the bunker. Then capture medals at the back to win. You should also try and do this as quickly as possible. In this scenario I would say that keeping your units pretty close together was probably a better bet than spreading them thin, simply because the victory condition in not so high as in other scenarios, and it’s easier to outgun a unit if you’ve several of your units attacking them. You get the fun of defending in this one. Dave and I did have a bit of a debate about whether or not it was more advantageous to stay in the bunkers and let the Allied player come to you, or to go out and meet them. We played it both ways. You’ve got a bit of an interesting set up, on the top of the cliff. You’re position is very good defensively, but a little annoying until the Allied player has moved a fair few of their units. My main comment for this one is to not (if possible) let your enemy destroy your artillery. Because of its range this unit is incredibly useful, but annoyingly, also fairly easy to obliterate if an enemy unit gets close enough. PROTECT IT. That’s what your unit in the bunker on the point is for – to stop anything getting to your artillery. General strategy point: be aware of the spread of your units in relation to your command cards. It’s very unwise to bunch all your units in one section of the board, as there may come a time when you have no command cards relevant to that section, which renders your turn useless and gives your opponent the upper hand. Set in 1944 on the 6th of June this scenario aims to replicate the D-day battle of Sainte-Mère-Eglise. Sainte-Mère-Eglise is a town in Normandy, north-west France. The town is used as the central setting for the board, as can be seen in the layout diagram below. The fight began with Allied paratroopers landing at 0140; this is simulated by the dropping of four units of Allied men onto the board from a height of around 12 inches. If they land on a empty hexagon they become a full unit, however, if they land on a German unit, or off the board, they are considered a failed drop. Many drops failed that night as buildings in the town were on fire. This lit up the sky making the paratroopers easy targets. There were also incidents like that of John Steele who’s parachute got caught on the church tower and he could only observe the battle and there were others who got caught in trees. At around 0500 the town was taken by the 505th parachute infantry regiment, it was then heavily counter attacked by the Germans, but the infantry held until they were reinforced from Utah Beach in the afternoon of June 7th. Historically speaking this was an Allied victory, however, the success of your parachute drop at the start strongly influences your chances of success or failure. The first thing to focus on when playing as the Allies is your parachute drop. You get four units that you have to drop from 12 inches above the board, if they land on an occupied space or off the board they are taken out of play, so you want as many of them to land safely as possible, so drop with care. Additionally, depending on where they land this effects what you do next. As the Allied player it makes sense to take the Axis unit that holds the town in the center first; depending on your command cards and on your parachute drop this can be quite easy as this unit is cut off from the rest of the Axis forces. Then holding the town and waiting for the Axis player to come to you is a fairly sound strategy as you then have the added bonus of the protection of the town at -1 against infantry and -2 against tanks for dice roll because of obscured line of sight. What I found while playing is that while the hill on the left side of the board looks like a good position, if you don’t reinforce it you may as well pull out because with the right command cards and a couple of moves that unit will be eliminated with ease. I also found that the single unit on the right is easily forgotten about by both sides, if it’s left by itself, as, if you’ve enforced the town in the center, the Axis player will move their right had units in towards the center in an attempt to take the town. So to move this unit into the cover of a hedgerow makes sense and, if possible, to reinforce it, depending on where your parachute men dropped. The Axis players are not so lucky as to have anything as fun and useful as the parachute drop, they do have one unit of tanks, but they also get one less command card. Assessment of where the parachute men fell is essential for the Axis player; the thing to keep in mind is that the win criteria is four medals (four completely destroyed enemy units). So seeing where their weakest units are and destroying them speedily makes good sense. I found that the unit on the left up the hill was most often left by itself so that was a good place to start, even with the -1 for shooting up a hill. Additionally withdrawing your unit from the town in the center to prevent its quick destruction was also a good idea. If the Allied player were to fill the town in the center it is highly possible to lose more men than it’s worth trying to retake the town; however they cannot hide all of their men in the town and will undoubtedly have some out in the open, here getting your tanks into play and focused on units not in cover is a good move, but to fire tanks into a town is close to a waste of a move as they fire at -2. Remember to try to keep units in all sections of the board as it will always be the section of the board you have no units in that you have all the command cards for! This is a good scenario with a lot of replay value due to the parachute drop creating a slightly different set up every time. Also being only the second scenario in the rule book it gives a small, basic introduction to tanks with one tank unit in play. It also introduces you to hedgerows and hills and is a well-paced second scenario for people still learning the game. However it lacks the fun of some of the later scenarios due to its relative simplicity and lack of lots of heavy weaponry! So we’re changing our format a touch! Or at least we’re going with what we feel like for now and we will review how well it works later and make changes accordingly. Instead of having a themed month and reviewing four to five games that fit into that theme we’re going to have just the one game for a month. 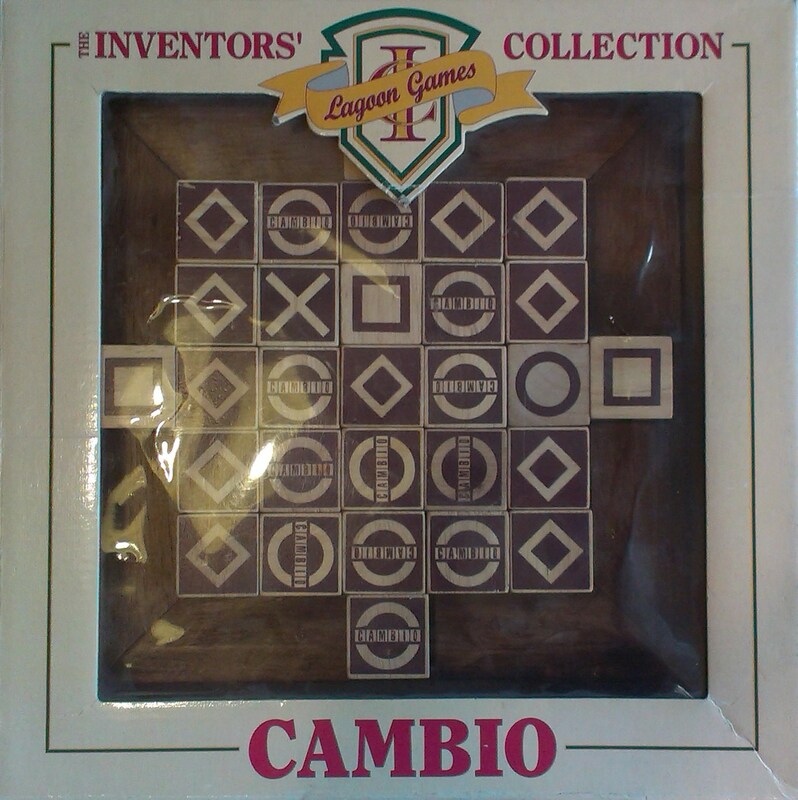 We’re going to play the game multiple times and do one review in the same format as we used to that covers the game in a basic form, then we’re going to play it in different ways or play it in all its scenarios (depending on the format of the game) and review each scenario or form of play individually. Hopefully this will result in a more in-depth look at the game, leave us with a greater understanding/appreciation for the game and allow us to actually comment on real strategy rather than having to say things like “we’re not sure as we’ve only played it twice but we think this might work <insert vague suggestion here>”. The game and rule book. This game we first played at the UK Games Expo in May, you can see us playing a huge expo variation of the game in our Expo video here. We loved it immediately and bought it at the Expo. As some of you will be aware it has the same designer as the game Battle Cry: the almighty Richard Borg. We have already reviewed Battle Cry and that review can be seen here. So strap in for a whole month of us going on about this game, analyzing every scenario, and even looking at the actual history of the given scenarios. We will also be keeping a running score at the bottom of each scenario post so you can tell which of us is getting better at the game, each of us will get 1 point for a loss, 2 for a draw and 3 for a win. By the end of the month it’ll be probably be clear which of us has the more strategic mind. We are actually back now and should be back for the foreseeable future. 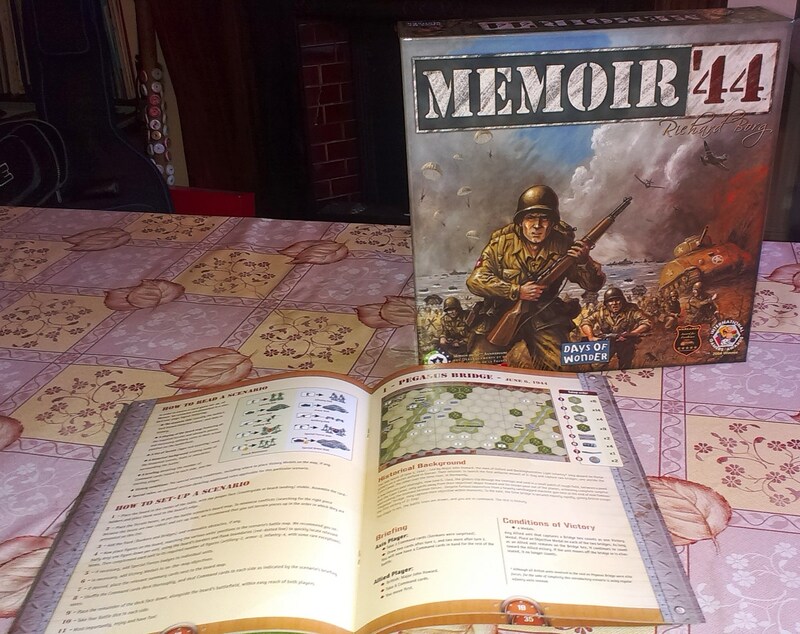 Hopefully, with this whole month being about Memoir ’44, we should get our first video review up about it, so that should be exciting. With there being more posts going up than there used to be (there should be at least 18 going up this month because there are 16 scenarios in Memoir ’44 plus this post and the over all review) it will be harder to commit to specific publications dates. We’ll say that Mondays will stay a sure thing, but depending on the game for the month (and how many posts it’ll take) we can’t be sure how regularly the in between posts will be going up. Update – We’re Back…Well Sort Of! I’m back (David). Having finished wandering around Wales I’m back and hopefully ready to get back on schedule. This is what Wales looked like! Unfortunately my sister is still wandering around Europe somewhere but I should still be able to get us back on track. I will make sure reviews go up on Mondays and hopefully the ones we missed will go up in between. Until then heres a nice video I made of my time in Wales, its mostly just shots of various animals and no games at all. But for people who like that kind of thing should be nice, also for people who like that kind of thing they should check out my girlfriends blog on nature stuff Here! Update – Sorry We Fail! Due to holidayness we have failed to play enough games to do all the reviews! My sister’s gone wandering across Europe and I’m about to go wandering across Wales. So I must apologise that we will not be able to publish our reviews as promised in the June Update post. But we will review Trivial Pursuit and Know it All in July; as well as the Kids Games month we had planned. But until early-mid July it’s unlikely we’ll achieve anything. I take great solace in the fact that I doubt anyone really cares but great pride in the fact that probably more anyones care than those that would have cared around 5 months ago! Anywa;y I hope you all have wonderful holidays planned, with plenty of games and craziness! So this is goodbye for at least two weeks or so… Hopefully less, but I make no promises.